The Youngstown Phantoms defeat Team USA NTDP 2-0 at the Covelli Centre on December 1, 2017. Typically, Ohio hasn’t been known as a hockey market. According to QuantHockey.com, only 27 Ohio-born players have ever seen the NHL level. As of the 2017-18 season, 48 players from Ohio have been selected in the NHL draft by a team. In June, that number is expected to rise again. According to Future Considerations, Curtis Hall, the 52nd ranked player in this year’s NHL draft, was not born in Ohio, but is a native of Chagrin Falls. He was born in Princeton, New Jersey, but moved to Ohio at a young age. Hall has played hockey for Ohio based teams nearly his entire life. Hall played for the Cleveland Barons, a development organization composed of three separate teams, based on age. Hall says he came from Cleveland, which isn’t a huge hockey area. He says it is important to work hard and whenever you’re on the ice, do your best. Hall has spent the last two seasons as a player for the Youngstown Phantoms. He has also been a member of the United States Hockey League and the Top Junior League in the United States. Youngstown is about 50 miles from Hall’s hometown of Chagrin Falls. Hall is in a unique situations; many players in junior hockey don’t have the luxury of playing close to home. The Phantoms have produced a sizable amount of talent over the years. Twenty-two players are playing in professional leagues, with a couple in the NHL. Kyle Connor of the Winnipeg Jets spent three seasons with the Phantoms before moving on to the University of Michigan and later the Jets. Hall aims to join the Phantoms’ impressive pedigree and take his talents to the professional level. Baskin says Hall should be able to start his college career at the center position and stick with it into the professional ranks. He says he has played well wearing a Team USA uniform. Baskin expects Hall to be selected in the second or third round, and he could eventually be the captain at Yale. Since education is one of his higher priorities, Hall is committed to Yale University, one of the most prestigious universities in the nation. He says a lot of players are moving on to big schools and he is excited to do the same. Hall says Yale is a great fit. He got along with the coaches and they have a great staff. He says everything just kind of fell in line for him at Yale, and he’s really excited to go there. The 2018 NHL draft will be held in Dallas on June 22 and 23. For interested NHL teams, his coach has the sales pitch ready. Patterson says not only was Hall their best player last year in the playoffs as a 16-year-old, two days after losing out against Chicago, the eventual champions, Hall called him to get their off-season strength program. He says Hall wants to get better every day and he does. 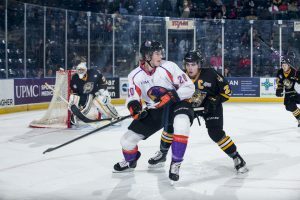 The Youngstown Phantoms lose 2-1 to the Green Bay Gamblers on October 20, 2017. Hall says Boston would be a good fit for him. He feels like they just work really hard and they’re a good team who sacrifice themselves for each other. Sticking with the theme of Boston, Hall models his game after Boston Bruins center and two-time Olympian for the United States, David Backes. While this is his last season with the Phantoms, Hall says he has plenty to look back on throughout his time here. He says he has a lot of memories to look back on, and all of the great people he’s met there. ONLINE EXCLUSIVE: It’s a Federal Frenzy!